Wonder Spouse uncovered this beautiful ring-necked snake while raking leaves away from the air-conditioning unit two days ago. The AC unit was roused by our 80+ degree weather and needed to be cleaned and checked for what promises to be a long, hot summer. The snake, however, was not quite convinced that its active season had begun. Its lethargy presented a photo opportunity, so I dashed inside and grabbed my camera. 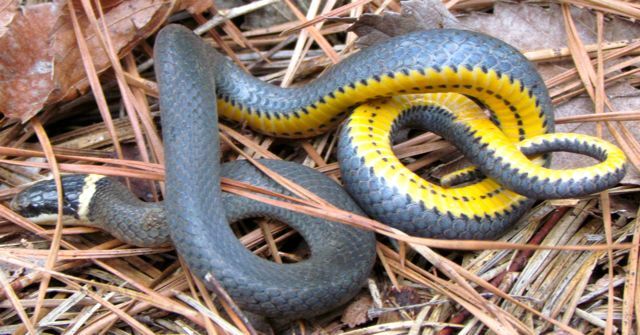 Ring-necked snakes are common residents of my Piedmont woods. They live in leaf mulch and other decaying vegetation, where they prey on earthworms and salamanders. I think they are especially attractive snakes, sporting vivid yellow bellies with golden necklaces to match. This one was about 16 inches long. They are harmless to humans, of course. And the red-shouldered hawks that hunt on the floodplain forest find them quite delicious. 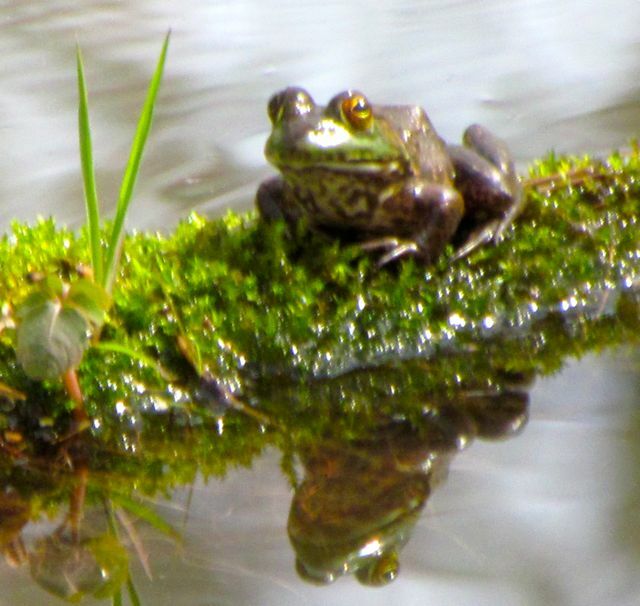 I think it is a bullfrog, because I can’t see any of the ridges that adorn the bodies of most of our other native frogs. But I’m not sure. This fuzzy shot was taken with my camera’s zoom feature, because as I got closer, it plopped into the water with a resounding splash. I like the way this fellow seems to be admiring his reflection in the water. Bullfrog tadpoles take two years to metamorphose. I can see a dozen or so enormous ones loitering in the shallows of the pond here. Bird migrators are coming and going, often stopping to refuel in my yard. Three dozen Cedar Waxwings have loitered for over three weeks. Their flight patterns remind me of fish schools in the way they can change direction on a dime without breaking formation. The Cowbirds returned three days ago. Their melodic gurgling call that sounds like falling water to my ear is unmistakeable. They hog my bird feeders until they pair off for nesting. 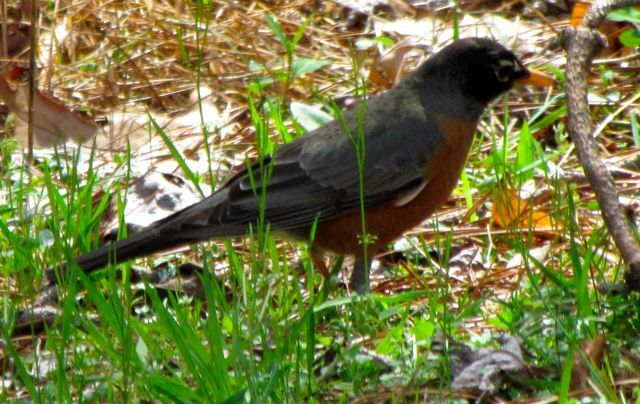 Flocks of boisterous Robins have been coming and going for over a month. Another group descended on us yesterday. They were having so much fun splashing in a mud puddle in our driveway that I had to honk the horn to get them to leave so I could exit my driveway. I think they like our yard for its abundance of earthworms — much like the ring-necked snakes, I guess. That’s the evergreen dogwood behind it, and the ‘Magic Carpet’ spirea just beginning to leaf out in the foreground. The cherry flowers hummed with honeybee visitors yesterday. Someone near me must be keeping bees again — good news for my garden to be sure. And the greenhouse seedlings are making it clear they are ready to be upgraded to larger pots. Roots of tomatoes, peppers, and basils are creeping out the bottoms of their starter pots seeking roomier accommodations. Weather permitting, they are next on my to-do list. Tis the season to be up and out and growing. Get busy, or get out of the way! 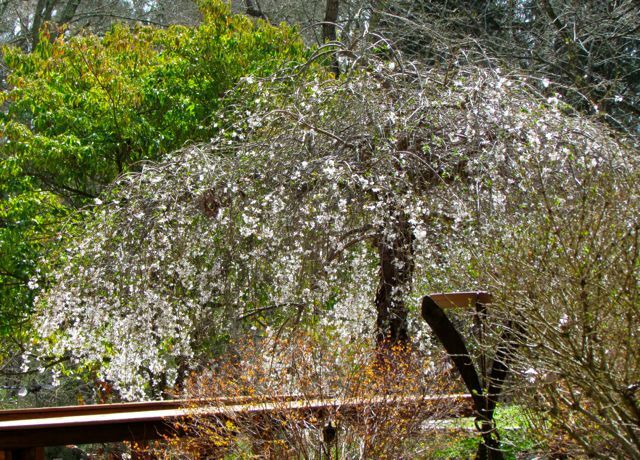 This entry was posted on March 18, 2012, 1:28 pm and is filed under Greenhouse growing, Native Wildlife, piedmont gardening, Vegetable Gardening. You can follow any responses to this entry through RSS 2.0. You can leave a response, or trackback from your own site. 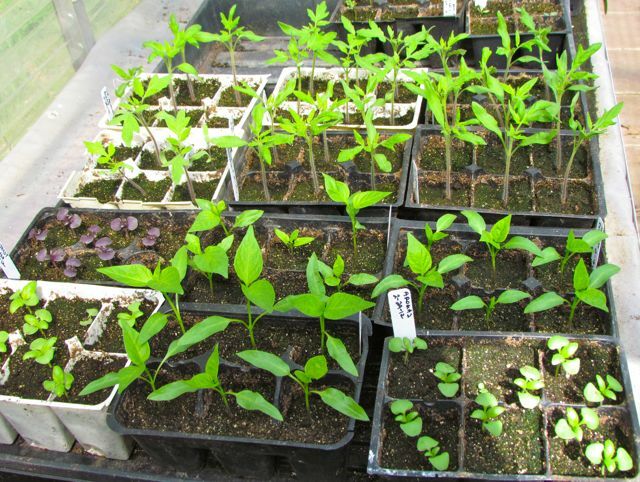 Your seedlings look terrific. I just planted tomato and pepper seeds today. I hope I have the same good results as you. Hi, Karen! Yes, my growing season is quite a bit ahead of yours, I imagine. I checked out your bathtub germination chamber — very clever. 🙂 I look forward to reading about how well it works for you.